The new 5th edition of Cancer-Matrix Manual represents the most effective compilation of scientific treatment regimens for the uniform cancer treatments with existing chemotherapy agents with inclusion immunoradiotherapy and adjuvant therapy. The treatment of choice is based on TNM system and classification and staging of cancer. It is an efficient and precise reference guide with detailed administrative instructions of the drugs accompanied in some cases either with post- or adjuvant radiation therapy. This a helpful tool with detailed delivery of clinical applications of the current chemotherapy agents alone or with adjuvant radiation therapy. 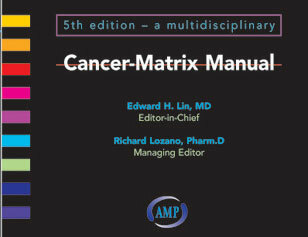 The new 5th edition has broken-up to two major sections of Oncology & Hematology matrix. The new edition has been substantially changed and updated. Every effort has been made to integrate surgical oncology, radiation oncology, pathology as well as the emerging molecular and interventional oncology. The Cancer-Matrix Treatment Manual is an invaluable compilation of the most effective (e.g., response, 3 & 5 years survival rates, clinical toxicity, with inclusion of SPIKES protocol for breaking new and guidelines for management of nausea, diarrhea, and pain,...etc.) existing drugs for treatment of all cancer types based on scientific findings/papers gathered from the peer reviewed journals, and articles presented in national and international conferences. It is printed pocket sized, enabling the medical professionals in the field of cancer to retrieve the treatment information quickly. The new 5th edition will feature substantial changes with updated treatment algorithms and radiation and chemo-radiation regimens in all disease sites. New AJCC 7th edition updates. Updated Oncology & Hematology section. Updated radiation and chemo-radiation regimens in all disease sites. Updates algorithm in many different diseases. Targeted agents and clinical trials. Introducing color-staging in treatment regimens. Latest updates including ASCO 2009/ASH 2009. Potential tumor reporting system integration. Upcoming multi- language version: Spanish & Chinese. The Cancer- Matrix Treatment Manual is an invaluable compilation of the most effective (e.g., response, 3 & 5 years survival rates, clinical toxicity, with inclusion of SPIKES protocol for breaking new and guidelines for management of nausea, diarrhea, and pain,...etc.) existing drugs for treatment of all cancer types based on scientific findings/papers gathered from the peer reviewed journals, and articles presented in national and international conferences. This is an invaluable and an excellent reference source for daily clinical practice for the professionals in field of Medical Oncology, Hematology, Radiation Oncology, Pharmacy, Nursing Oncology, Residency programs (Fellows in Medical Oncology, Hematology & Radiation Oncology and related fields), Nursing & pharmacy schools, Medical Students, Nursing oncology fellows, & pharmacy residents & students, & pharmaceutical industry.